. : Optics & Photonics Focus :: Eyeball Cameras: Beyond Biology :. Have you ever been confused by an answer? Usually answers increase our knowledge, but latest experiments now show that asking two weak questions can leave us with less information than asking only one. The flexibility of today’s commercial cameras is limited by the use of solid lenses and rigid detector chips. Biologically-inspired eyeball cameras with deformable imaging elements could soon revolutionize the way our devices capture the world. Eyeball Camera. The image shows an adjustable-zoom camera that fits into a small, eyeball-shaped package. The human eye is truly a marvel of imaging technology. It boasts simple yet sophisticated optics, quickly adjustable focusing capabilities, and a fully-integrated image processing and adaptation system — the brain. Although humans have benefitted from this advanced imaging system for millennia, we have had difficulty reproducing the eye’s imaging features in a similarly elegant package. Mimicking the behavior of the eye may seem like a simple concept, but it is quite an engineering challenge. John Rogers’ group at the University of Illinois, USA, has recently achieved just that: They took inspiration from key anatomical elements in the eye and built a camera with adjustable-zoom capabilities that fits into a small, eyeball-sized package. The eye is a liquid-filled globe with four primary elements for imaging: the cornea, a curved surface at the front of the eye that provides most of its focusing power; the iris, an opaque ring that determines the size of the pupil and gives the eye its color; the crystalline lens, a flexible lens that adds an adjustable amount of focusing power to the cornea; and the retina, a densely-packed array of light receptors on the curved surface at the back of the eye. The iris, the crystalline lens, and the retina work as a unit to accommodate different imaging situations and preserve a high level of image quality. For example, the eye can quickly zoom to focus on near or far objects by appropriately adjusting the shape of the crystalline lens and the field of view on the retina. Commercial digital cameras have a variety of zoom capabilities, but none of them operate on the same fundamental principles as the eye. Rogers’ group was inspired to build a system that can focus just like the eye — using only a small, flexible lens and a curved detector surface — while maintaining excellent image quality. A commercial manmade photographic system requires two lenses with variable separation between them in order to change focus. By contrast, the crystalline lens can change its curvature to create different focusing levels in the eye. In the past couple of decades, researchers have developed novel manmade lenses with adjustable, or tunable, curvature that behave much like the crystalline lens. 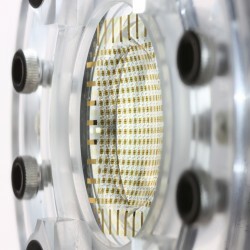 These lenses typically use an elastic, liquid-filled membrane that changes its shape with the liquid pressure. Rogers’ group adopted this approach and built a tunable lens that changes its curvature predictably in response to the water pressure inside the elastic membrane. This liquid lens provides variable zoom with a single element — just like the eye. A tunable-curvature detector array. This hydraulically-controlled detector changes its shape to match the perfect imaging surface of a simple lens, thus removing the need for additional correction optics in the eyeball camera. After light passes through the crystalline lens of the eye, it is collected on the curved surface of the retina. In fact, whenever a simple lens focuses light, a perfect image is formed on a special curved surface — known as the Petzval surface — where each point on the surface has an equal optical path length to the object being imaged. This effect arises due to the shape of a standard lens: when light passes through a lens, the light ray passing straight through the middle of the lens slows down due to the thickness of the glass, while the light ray passing through the edge of the lens barely slows down at all. If these rays have the same effective optical path length, they will focus perfectly at a point on the Petzval surface. Since the lens surface is curved, the matching Petzval surface for perfect imaging is also curved. Detectors in conventional digital cameras are flat, so they cannot match the Petzval surface of a simple lens. Moreover, the shape of the Petzval surface changes according to the curvature of the lens. As a result, camera companies have to add more lens components to correct for the Petzval surface mismatch and obtain even better image quality. In Rogers’ group, instead of adding more lenses, they tackled the Petzval mismatch problem by modifying the shape of the detector itself. First, they printed a silicon photodetector array onto an elastic membrane. Then, they built a hydraulic system for tuning the curvature of the detector membrane, to match the Petzval surface at different lens curvatures. With this approach, the number of imaging elements remains small — one lens and one detector — but the image quality and zoom capabilities can theoretically match the performance of bigger cameras with more optical elements. "We had to go ‘beyond biology’ to achieve the kind of zoom magnification capabilities that are found in manmade devices with more conventional designs," says Rogers. According to Karl Brommer at BAE Systems, "[Rogers’] technology reduces the number of lenses needed in many kinds of imaging systems, leading to smaller, less expensive cameras capable of implementing new imaging techniques." Eyeball cameras could be particularly useful in night vision, endoscopes, or cell phone applications. "The key challenge," says Rogers, "is to demonstrate our ideas with otherwise conventional, high-resolution CCD [detectors]. Right now, our cameras only involve a few hundred pixels, and they are hand-built by graduate students and postdocs." In time, high-resolution eyeball cameras could change how we — and our devices — capture the world. 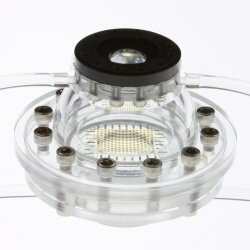 Inhwa Jung, Jianliang Xiao, Viktor Malyarchuk, Chaofeng Lu, Ming Li, Zhuangjian Liu, Jongseung Yoon, Yonggang Huang & John A. Rogers, Dynamically tunable hemispherical electronic eye camera system with adjustable zoom capability, PNAS (2011) 108, 1788–1793 (link).